We got a bundle of papers from the Property Owners Association about building in the Village. The bundle included a list of builders. I talked to about a dozen of them over the phone and FAXed them my floor plans and a list of as many building specs (e.g. : stucco walls) as I could think of. About half of these builders were eliminated after the phone conversations. I met with the others. Picking a builder is a personal decision based on things that may be important to one person but not to another. For example, if you are set on a steel framed house, that will eliminate most of the builders. I was interested in a steel framed house, but the only steel-frame builder who I could get on the phone was running behind on a house she was building and never gave me a bid. We felt that picking a builder with a long list of happy customers would be less of a crapshoot (but not entirely -- past customers may gloss over problems, may not be aware of hidden flaws which haven't surfaced yet, or may simple not be concerned with having the highest level of quality). Roger Craft had a long history at HSV. We talked to his past clients and received rave reviews from all but one (which we wrote off to "you can't please everybody"). We also talked to his banker and suppliers to make sure he was financially stable. We were also reassured by the fact that his wife has a successful real estate business, providing additional financial stability. But even established builders face unforseeable disasters. A builder could be in the middle of building your house and become incapacitated or even die. We could pay extra (directly or indirectly) for a "completion bond", which means that if the builder does not complete our house for any reason, the bond issuer will pay someone else to finish it. However, since Craft has a construction supervisor, we felt confident that even if something happened to Craft, the house would be completed. With the exception of Cooper Homes, we did not have this confidence with other builders and would have had to pay for a completion bond. Just to show that nothing is for certain, Roger Craft quit the business in 2002 (several years after completing our house). His construction foreman, Bill Smith, has taken over the business and is continuing to provide support for Craft's past clients, as well as building new houses. Craft was computerized and was the only builder to promptly send us a detailed bid (generated by his floor plan software) showing the cost of each item and his profit on the job. Other builders only gave us ballpark figures or cost-plus bids. Interestingly enough, although Craft's bid showed that he was getting an 18% profit, his total bid was equal to or less than bids from some other builders who claimed cost-plus-10% (or less). That, alone, was enough to make me wary of cost-plus builders. The reason that I wanted a computerized builder is that their software lets you actually move around the floor plan in a 3-D mode to see how things look. I wasn't happy with the master bathroom layout I had drawn. Craft was able to show us the bathroom in 3-D and move showers, tubs, walls, and windows around until we found what looked best. It would have been difficult, if not impossible, to do this with hand drawings. Danny Breshears, the cabinet builder Craft used, is also computerized and again, we were able to sit at his computer and try different designs and layouts of cabinets, bookcases, etc., until we liked what we saw. Breshears also offered some excellent suggestions to improve my cabinet layout. And best of all, when the cabinets were installed, we were extremely impressed with the look and quality of them. 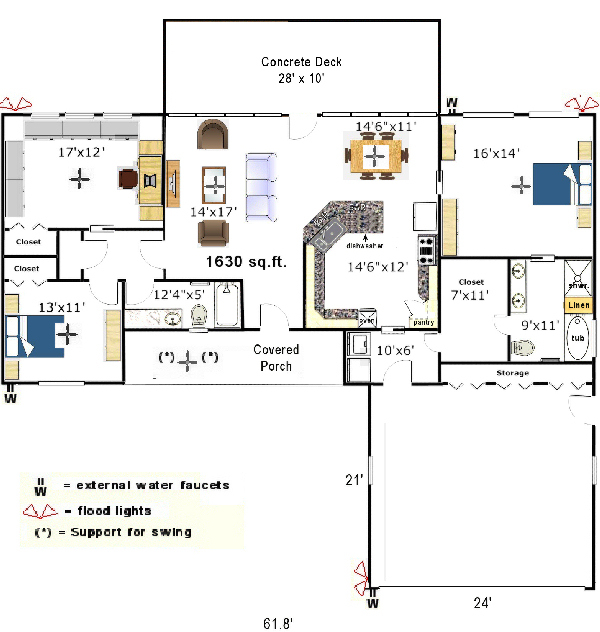 In looking for a builder for Judy's house, we did not talk to anyone who put her floor plan into software to generate bids like Roger did for us. This also meant that we could not use such software to fine-tune the plan I had done by hand. Likewise, it is my understanding that Breshears is now (in 2007) working exclusively for Cooper Homes. As a result, I felt it necessary to draw an elevation of the kitchen cabinets to see how many and what size would fit. It's a good thing I did because it revealed some problems which had to be addressed, mainly the corner where cabinets come together. We wanted a builder whose past work was similar to the style and construction which we wanted for our house. All the builders we talked to were willing to show us homes under construction as well as completed homes. We would probably not have picked a builder who had no homes under construction. HSV is a hot building area, so all good builders normally have homes (OTHER than spec homes) under construction all the time. In touring some of Craft's homes, we really liked the looks of one that was under construction, which had a great room with an 18' ceiling and a loft overlooking the great room. Cooper's architect had come up with an elevation based on a vaulted ceiling over the den (and no loft). We thought that the high, flat ceiling looked more contemporary than the angled, vaulted ceiling. Also, Craft came up with an exterior elevation which we liked better than the ones done by other builders. Experience is an element of past work, but does not equate directly. If, before moving to HSV, a builder has spent the last 20 years of building simple tract houses on flat land, then he has what we call "one year of experience, 20 times". Another builder may have spent 10 years building a wide variety of houses on the wide variety of topography of HSV. He only has half as much "past work" as the first builder, but he has 10 times more "experience". At first we were shocked at what seemed to be a lot higher building cost in HSV compared to Houston. One reason (we were told) for the higher cost is that building materials are not as cheap and abundant as in a big city. Another reason is that the Property Owners Association has rather high fees for building permits and a sewage grinder - almost $6,000 for our house. Another is that Houston, where we moved from, has a large pool of cheap labor (much of it not legal). On the other hand, we soon came to realize that while workers may cost more around here, they also seem to be more experienced and do a more careful and higher quality job. They also take longer. Figure on about 7 months on average to get a house built in HSV. Our house in West University Place in Houston was bigger and more expensive than the house we are building in HSV, but the quality of materials and labor that went into our Houston house was MUCH lower than what we have gotten here in HSV. The average cost of a custom home in HSV is usually about $85-$90 per HEATED square foot (in 1998). This can vary drastically depending on building materials (example: brick or stucco versus vinyl siding). "Heated square footage" means that the size of the garage is not used in the calculation. Also, landscaping is usually not included in HSV bids. Landscaping can cost anywhere from a few thousand dollars to infinity and beyond. See Landscaping. For the house, we put bids out to about a half-dozen builders and got bids ranging from $65 to $115 per square foot. But our selection really came down to Craft and Cooper, for other reasons. Craft's bid was $50,000 less than Cooper Homes' bid, even though Craft's plan included an extra 300 square feet (for the loft) and a 3-car garage (instead of 2-car). A friend of ours used Cooper Homes, but he used one of their plans (with a few changes). Cooper has a good reputation for quality of construction and evidently is not as exhorbitantly priced when using their own plans. We also liked Craft's design for the ceilings and exterior of the house much more than Cooper's. However, if Cooper had been $50,000 less than Craft (instead of vice-versa), we probably would have settled for their plan. Below are some things to watch for when comparing bids. If you find these differences, you should adjust the competing bids accordingly. However, what you really want to do is give a detailed list of specs (including the items listed below) to each builder to insure that you get comparable bids that you don't have to make adjustments to. Name-brand windows -- Because of the beauty of HSV, most houses have lots of large windows. The number and size of windows can greatly impact the total cost. Builders can save a lot of money by not using big-name windows like Pella and PeachTree. The cost difference may or may not be justified (we didn't think so). Most builders are going to quote double-paned windows for at least some insulation value. Argon gas between the panes can increase the R-value, but for how long (before the gas leaks out) is anyone's guess. We have large trees shading our windows during summer afternoons, so we opted not to pay for Argon. Another option you can get is tinting to help keep sun out. We took our builder's advice to wait to see how bad the sun would be and then adding tinting later if needed. Intead of tinting, we got shades on west-facing windows with electronic control so that they close automatically during hot summer afternoons and open again at dusk. Update 2008: We eventually got our West-facing windows tinted. Also see this section for more information about window specifications. Exterior wall studs -- Some builders (particularly from the North) use 2"x6" studs for exterior walls in order to put more insulation in the walls. Our research showed that payback time for the higher cost was too long due to the relatively mild climate in HSV. Also, many houses in HSV have lots of large windows to maximize the views. You are going to lose so much heat/air due to the low insulation properties of these windows that surrounding them with a little more insulation probably won't make that much difference. Brand of heating and air conditioning units -- These are high-dollar items and brand pricing can vary significantly. Most builders use heat-pump units which exchange heat with the outside air. Lakefront property owners have the option of using geothermal heat pumps which exchange heat with the lake water. Ground-based geothermal heat pumps are probably not worth it due to the high cost of trying to dig through the shale layers prevalent in HSV. However, one friend here with a 4000+ square-foot house had a ground-well based geothermal heat pump put in. His house's greater demand for heating and cooling probably made the investment worthwhile. Type of roofing. We opted for an architectural shingle that has a look of added dimension and different size shingles. This is reasonably priced and has a very attractive look. 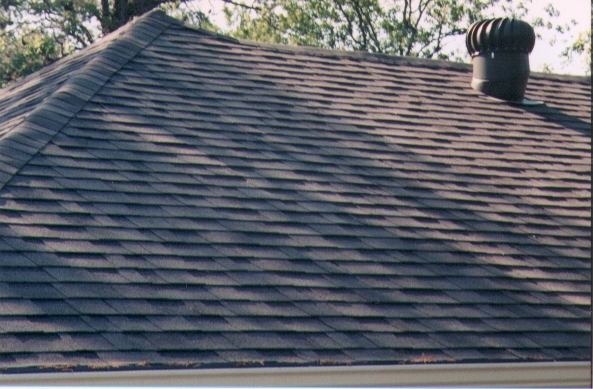 (Compare the picture just linked to a regular flat shingle.) Other options to be considered include the type of attic ventilation and whether to have gutters all or part way around the roof. We chose complete guttering, but then that brings up the problem of how to keep them free of leaves. Options including "gutter helmets" or a screen over the gutter. We got the screen, which is undoubtedly cheaper, and after 6+ years have had no problems. Ceiling height -- Most builders use 9' ceilings with a vaulted ceiling in the family room. Many have "step-up" ceilings in the dining room and/or in the master bedroom. If you specify a step-up ceiling, make sure to specify that it steps UP (into the attic space) rather than being built down on the sides into the living space. For the former, the ceiling joists have to be ordered with the step-up area built into the joists. Also, some people refer to "step-up" ceilings as "trayed ceilings". The later are actually a form of step-up ceiling where the step up is slanted, like an upside-down tray, so make sure the builder knows which type you want. Garage size -- Even if you do not intend to buy a golf cart, consider getting a garage with room for golf cart storage. It will pay for itself in resale value, while you can use the space for a work room, boat storage, home gym, etc. We had specified a two-car garage, but Craft put a three-car garage into his bid, and we are glad he did. Besides two cars, our garage contains a weight machine, treadmill, stationary bike, two road bikes, two 12' kayaks, lawnmower, edger, garden tools, work bench, potting bench, two shelf units, file cabinet, wheelbarrow, a row of storage cabinets, and more. At least a half-dozen people in our neighborhood had their garages expanded for a third bay after moving in. It's cheaper to do it in the first place. Walk-out basement -- Most lots in HSV have enough slope to them that there is room to have a walk-out basement on the down-slope side of the house without having to do any excavating. Even if you do not think you will need the space, see what it would cost to enclose the space with real walls (instead of the cinder block) so that it could be finished later if desired. It could be a worthwhile investment to have it done cheaply now. Skylights -- Everyone who has a big skylight over their kitchen loves it, despite horror stories you'll hear about their leaking. We didn't get any skylights, but Judy got two. Both her kitchen and master bath have no windows (although the kitchen faces a wall of windows), so she opted for a skylight in each. Skylights come in many sizes. The cheapest and easiest to install will fit between two roof rafters. While this is small on the roof, the walls leading from the skylight on the roof to the ceiling in the house are angled out to create a much large area of light. We decided during the building process on our house that our dining room area was too dark (which I should have realized during the design stage) and we couldn't put in skylights at that point, we added a SolaTube to the hallways at each end of the dining room. A SolaTube is just a silvered tube from a dome on the roof to a translucent covering on the ceiling. It is not any bigger than a standard ceiling light fixture, but gives you free light all day. I now wish we had one in the master closet, but that part of the attic is not accessible now. One last note: SolaTubes are not really any cheaper than skylights, and in my opinion, skylights are more attractive. Countertops -- The variety of materials for kitchen countertops is huge these days (2007). I recommend Googling for "countertops" and doing some research. Formica is no longer cheap looking. They can make it look almost like granite, and if that is not close enough for you, Formica makes a "solid surface" material (similar to Corian) and one of those finishes looks like granite. Of course, those materials will not be as scratch- or heat-resistant as granite, but will be maintenance free and much cheaper. If you sign a contract to get a house built for a specific price, you may be surprised at closing to find the final price to be much higher. Two things which will affect the final price are (1) allowances and (2) changes in the project. (1) For Judy's house, we specified NO allowances in the contract. We described in detail the kitchen appliances and light fixtures, bathroom exhausts, tile and carpet, etc., which Judy wanted. Not having ANY allowances is extremely unusual and some builders who bid on Judy's house put allowances in their bid anyway, but Buss Construction did not. If it is necessary to have allowances, make sure they are for specific items. For example, if you want to pick light fixtures at a later date, the allowance should specify the exact types of fixtures and where they will go and not just have an allowance for "electrical". Some builders may want allowances for foundation blocks or for concrete or whatever. If you have no problem with allowing that, you should be using a "cost-plus" contract, not getting bids for a fixed-price contract. In a cost-plus contract, the builder supposedly takes a smaller profit because you are assuming the risk of rising prices, job site problems, etc. In a fixed-price contract, the builder bids a higher price and assumes those risks, but if he puts in allowances such as those mentioned, he is taking the higher profit and passing the risks to you. (2) Any changes to the building project and thus to the final price should be in written "change orders" signed by both the builder and the buyer so that there is no argument at closing over what the final price is. Update: In the process of building Judy's house, virtually no change orders were used. This was frequently a benefit to Judy because Buss was doing more or providing higher quality than we had specified. However, there were a few cases where things were not to our specs. Because Buss was doing so much more for Judy than expected, we tried not to make a fuss about things not done to specs which Judy could live with. When we did feel strongly enough about discrepancies to point them out, Buss was good about fixing things to comply with our specifications. To avoid having allowances in the contract, we left the selection of some things, such as bath tub and shower units, up to Buss. In some cases he chose things we would not have chosen, but we did not think it would be right to get a fixed bid by saying we were leaving choices up to him, then try to change his choices, so we accepted them. For things like faucets, door handles, tiles, carpet, etc., for which we did not have an allowance, we left the choice to him, but Judy selected items at Home Depot as a guideline to what her taste is and asked him to come as close to the styles and colors chosen as possible within whatever budget he had. For kitchen appliances, again, we left the choice to Buss, but we specified stainless steel finishes, which assures a certain level of quality since G&E and others don't usually offer their cheapest models in stainless. If you look at Judy's specs, you'll see that we specified an "ultra-quiet" dishwasher with stainless exterior. A stainless interior for a dishwasher costs a lot more, but appears to be primarily a cosmetic feature. The "ultra-quiet" will help assure something other than a bottom-of-the-line model. During the entire building process, Craft stayed "Mr. Congeniality", no matter how much I bugged him about problems, real or imagined, and no matter how many changes we asked for (despite promising ourselves that we were not going to make changes during construction). I can't tell you how many times during both the design process and the building process that we independantly came up with the same solutions for problems. It was very reassuring to have both us on the same wavelength all the time. I am hypersensitive to someone's trying to B.S. their way out of a problem instead of trying to fix it. Craft was always straightforward with us and fixed problems to our satisfaction. He rarely tried to dissuade us from anything we wanted, so when he did tell us that we probably would not like something done the way we wanted it, we took his word for it. This is not meant to be a gushing testimonial for Craft. Heck, you may not be able to stand being around him! I'm just saying that when you pick a builder, it is important that you are able to get along with him and trust him. During our selection process, we called one highly-rated builder about a half-dozen times and he was never in. He was always out checking different job sites. We concluded that if we could not reach him to interview him for the job, we would probably not be able to reach him if something important came up during construction of our home. Craft has a construction supervisor, so Craft was usually at the office where we could reach him when we needed to. Responsiveness also means how responsive the builder is to what you want and need. If you ask a builder for something and he indicates that what you want is not possible, he is not being straight with you. ANYTHING is possible -- it's just a question of how much time and money it will cost. The builder should explain the costs to you, but then leave the final decision up to you. If a builder blows you off by telling you that he can't do something, what he really means is that he doesn't want to. He may have perfectly sound reasons for not wanting to, but then he should tell you those reasons, not blow you off (unless, of course, you have been making a royal pain of yourself). One of the last builders I talked to (after showing my plans to a dozen other builders and a couple of architects) spent the whole time criticizing my plans. But when I would ask for specifics about something he didn't like, he couldn't provide any. He would just start criticizing something else. The problem was that he thought there was only one right way to design a house, and that was HIS way. What he really wanted was for us to use one of HIS floor plans. I could not get off the phone with that builder fast enough. A funny side note is that I told Craft about this conversation but I didn't want to tell him the name of the builder. Craft said: "You don't have to tell me; it was ...", and sure enough, out of dozens of builders in HSV, he knew who it was. It turns out that the guy is notorious for his closed-mindedness. However, to be fair -- the fact that that particular builder is still in business only goes to show that everyone has different tastes and needs. Everyone is going to like different things about different builders. The best thing you can do is talk to a lot of them and thoroughly check out the ones you are interested in. Probably the most important things you can do are to look at a builder's past and present work and talk to past customers. When you go through the houses under construction, look for anything that doesn't look right and question the builder about it. We toured houses of some builders that had sloppy work in them. When we questioned the builder about these things, they would make lame excuses. Naturally, we avoided those builders. Again, the builder doesn't do the work himself -- the subs do -- but it is his responsibility to hire good subs and to make sure that they do their jobs right. Get a list of past clients and interview every one of them if you can. Almost every client we called invited us over to see their house. This gives you another chance to check out the builder's work and to get straight talk from the owners without the builder being around to influence them. How quickly did the builder take care of problems that arose after they moved in? Were problems which arose during construction resolved to the client's satisfaction? Did the builder go over the budget without warning the client first? Was the builder flexible in making changes to the plans during construction? Was the builder generally easy to get along with and easily accessible to the client during construction? What are some things that the owners would go back and change if they could? This is a much more productive question then asking them if they are "happy" with the house. If the owners say there is nothing they would change, they either are not being straight with you or they genuinely didn't care what the house looked like, because there is ALWAYS something that you would change if you could, no matter how small. This answer will give you ideas about things to add to your plans or to avoid. Expertise, coming from experience and intelligence. Going into the building of Judy's house, I thought I knew a thing or two about building houses based on my meager experience, but things came up that I knew nothing about, but which, thankfully, the builder (Jim Buss) did. Conscientiousness. A general contractor usually hires subcontractors to do a lot of the work, such as concrete work, roofing, siding, plumbing, painting, etc. Even though the subs are responsbile for their work, your builder (contractor) has the ultimate responsibility to ensure that the subs have, indeed, done good, conscientious work. This really isn't all that difficult. The builder must simply check in on the work that his employees and subs are doing to inspect the work when completed. It sounds simple and obvious, and it is, but you would be surprised how often this is NOT done, not only in home building but in most other businesses. Discovering how conscientious a builder is goes back to things discussed above: talk to his past clients and inspect houses he has built. The more specifications you can put into your bid request, the less room you give the builder to improvise and the more likely that you will be satisified with the final result, everything else being equal. Unfortunately, everything else is not equal. Not matter how detailed your specs are, there will always be choices of materials to be made, choices of how to handle unforseen problems that arise, and simply the care and quality of work that the subs are willing to provide and/or the general contractor is willing to require. The only really "acceptable" type of mistake is when an experienced, expert doing a careful, conscientious job still overlooks or mis-does something, and then fixes it like it should have been done. Next down the list is when a person makes a mistake because he lacks the experience or knowledge that would have helped him avoid the mistake. If the person was hired by someone who was supposed to have the expertise to insure only qualified workers were used, then the fault lies with that person, not the worker. But if a worker misrepresents his skill or expertise to a client, then his failure to do a good job is his fault. Next are mistakes resulting from carelessness. If a person just does sloppy work or makes a slip and just lets it go, he is showing an attitude we used to call "close enough for government work". He doesn't intentionally make a mess of a job, he just doesn't make any effort to AVOID making a mess of things nor to fix the mess afterwards. The lowest depths of hell are reserved for people who know they are doing something wrong, but they do it anyway, especially if they think that the client will never know the difference. For example, a painter who is supposed to put on two coats of paint only puts on one, or he fails to paint an area he doesn't think you will see until it's too late (such as behind hard-to-move furniture), or he uses fastners to hold something together which he knows will fail over time, etc. In 2007, when Kay's sister, Judy, started looking to build, we did the legwork for her since she did not live here yet. We started by talking to some builders who had done houses in our area and one, Buss Construction, whom we met at a home trade show at the Coronado Center. We also found a list of builders in the advertisement section on the POA web site and sent bid solicitations to them. The first formal bid we got back was from Buss Construction. It was very professionally done, had a good amount of detailed, more than covered all the points of our specs, and came in at a good price. Other bids either were not as detailed or did not match our specs. After meeting with Buss Construction and some other builders, going through their houses and talking with them, we selected Buss. When Judy first bought her lot in the summer of 2006, we talked to BuilderBids.com. This is a company which standardizes your home specifications and puts them out to bid to a number of builders. By having each builder bid on the exact same specs (in theory, at least), their bids should be directly comparable. It was our understanding that this was a no-cost service for buyers, and that the builder who was chosen paid a fee to BuilderBids.com. (But don't the builders pass that cost along to the customers, one way or another?) However, when we were ready (in 2007) to search for a builder, Hunter Ray, the new owner of BB, told us that we needed to pay about $500 to have BB draw up floor plans for them to use as the basis of generating specs for the bids. By the time we had talked to BB, we had already talked to several bidders whom we had met, and those builders were able to give us detailed bids without a formal set of blue prints, just using our rough floor plan and our specifications. We told Ray that we did not wish to pay $500 for floor plans just to get bids and he told us, then, we could just use one of the builders we had already talked to. Later, about the time Judy was ready to sign a contract with Buss, someone from BB called Buss and told him that we were putting out the job for bid and would he like to bid on it, despite the fact that we had told BB the names of the builders we had already talked to so that they would NOT contact them. Naturally, Jim Buss of Buss Construction, whom we had already selected by this time, called us concerned about our supposed continued search for a builder, and we had to reassure him that we were not. (1) If you start with a drawing like the one we used, the builder you eventually choose will have to have formal floor plans drawn up, so you will pay for them sooner or later. However, you will undoubtedly make many, many changes during the time it takes you to choose a builder. If you have already paid for a formal set of plans, find out what it will cost to have them redrawn for submission of final plans to the POA. (2) The bidding process is not all about getting the best price. When you talk to builders yourself, part of that process will be seeing how the two of you get along, finding out whether he is a talker who has his own strong ideas about how everything should be done, or a listener who will try to understand what YOU want. We have often said of Craft that his willingness to go along with things we wanted caused us to give more weight to his opinion when he did NOT agree with us. Unfortunately, people skills are not the same as home-building skills. Two of the builders we talked to, who are definitely not "listeners", build very high quality houses, but mostly spec houses, not custom ones. One of them started by telling me that he could build for $100/sf, then he told my wife $125/sf, then after we gave him the plans and specs, he gave us a price which worked out to about $150/sf, which he must have pulled out of a hat, because he had no supporting detail for it. The other builder simply never gave us a bid. There is no question that building custom homes and dealing with clients who may get too involved and/or bossy is not as peaceful as building a spec house. It is possible that they decided that someone providing pages of specs would be more trouble than they would be worth, though it is certainly our goal not to make any changes or interfere once the job begins. Builders have the right to choose the kinds of clients they want to work with, just as you have the right to choose the kind of builders you want to work with. (3) Another part of the process will be in seeing how builders respond to the request for a bid. Buss responded promptly with a very professional looking and complete bid package. The only more detailed bid we have ever seen was from Roger Craft when he bid our house. He put our plans, etc., into a computer and automatically got not only a professional floorplan, but a materials cost list for every piece of building material used. Other builders never got back to us; others took a lot of time getting back to us. Some did not bid to our specifications, leaving us wondering if they had even looked at them. From the builder's point of view -- doing a detailed cost analysis on a floor plan and its specs may be a time-consuming task involving researching the current costs of all the materials and products going into the house, the availability of subs and what they will charge, and so on. It is easy to understand that if a builder feels you have put out specs to dozens of different builders just shopping for the cheapest price, they may not want to invest the time and money preparing an accurate, detailed bid. Still, bidding is a necessary part of builders getting new work, so at some point, they have to make the effort or resign themselves to just building spec houses (which some builders do, in fact). (4) When you do your own bid soliciting, you will also be going out to the sites of homes completed and still under construction by the various builders. In fact, one of the many reasons we chose Craft to build our house was that he took us to a house with some major features similar to what we wanted. Visiting builder's job sites is a way of seeing the quality of the work they do. In completed houses, you will often get to talk to the owners and get some feel of how what they think of their house and the builder. If BuilderBids had been around when we were looking for a builder for our house, we may not have ended up with Roger Craft. He was NOT the cheapest (nor the most expensive), so we may have never talked to him, and that would have been too bad. For Judy, I tried to use BB in addition to the personal builder contacts I had made, but as I've already related, that didn't work out. If you are able to talk to some builders first and then use BB (without having to pay them any big fees), then it certainly doesn't seem like you could have much to lose and might get some good leads/bids. If you decide to try BB, you might want to ask them how many builders they actually will submit your plans to. I was led to believe that it would be dozens and we could select from the best 4-5 bids, but I was told (but cannot confirm) by somebody who should know that they only have 4 or 5 builders they submit to. Of course, this could change in the future.